Prospect Park Books, 9781945551499, 184pp. In Paperback L.A., A Casual Anthology Book 3, our contributors deftly command fiction, nonfiction, playwriting, magazine writing, memoir and other forms to conjure up visions of a Beverly Hills Wonderbread factory, the founding of the first sustained gay rights organization in the country, early 20th-century wagon-train settlers in Dodger Stadium area, a late 20th-century DTLA traffic tie-up that becomes a kind of symphony, a humorous 1940s novelty song whose refrain buoyed civil rights activists, the 1990s outrigger-team apprenticeship of a Tongva youth--and more. Plus, photo essays on "Motion and Stasis," "Hometown Gold," "The Right Notes," and "Nowhere. 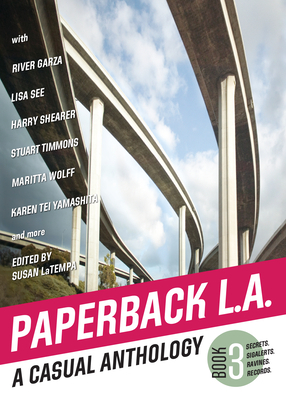 Susan LaTempa identifies as an editor in Los Angeles, not as a Los Angeles editor. At L.A. Style, West Coast Plays, Padua Hills Theater Festival, Westways, The Los Angeles Times, and Liberty Hill Foundation, she's worked with journalists, playwrights, novelists, recipe developers, landscapers, photographers, and videographers. She's concentrated on addressing L.A.'s vast, cosmopolitan audiences, in the process helping shape dozens of memorable articles, reviews, memoirs, parodies, essays, theater pieces, and videos that have illuminated so many aspects of L.A.